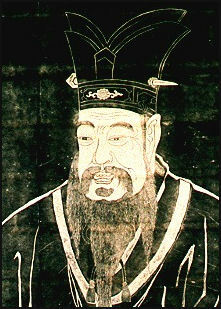 Confucianism is credited with making Chinese society fiercely patriarchal and defining its social stratification with: 1) scholar-bureaucrats at the top, because they had the knowledge and wisdom to maintain social order; followed by 2) farmers, because they produced the necessary goods; and 3) the artisans, because they possessed necessary skills. At the bottom were 4) merchants. All they did was buy and sell things. Society began to change when the merchant class made money and used it to increase their power, prestige and education level. Some argue that traditional stratification has broken down and been replaced by a new hierarchy with merchant-bureaucrats at the top, farmers are at the bottom, and artisans being replaced by factory workers and migrant labor and scholars being repressed by the government. Structure and hierarchy have traditionally been very important in all levels of Chinese society. People are expected to observe mores on rank and position and show humility and deference to their superiors. By showing deference one tends to raise their own position in the view of others rather than lower it. See Confucianism. Confucius was not interested in individual salvation or individual rights. What he cared about most was the collective well being of society. He promoted virtues such as courtesy, selflessness, obedience, respect, diligence, communal obligation, working for a common good, social harmony, and empathy. The code of behavior he described was based on a system of harmonious, subordinate relationships based on the notions of filial piety, a well-ordered family, a well-ordered-state and a well-ordered world. Confucians stress that a person’s worth is determined by public actions. The concept of li defines a set of social relationships and clearly described how people are supposed to behave towards one another. Fealty in Confucian terms takes five forms: 1) subject to ruler, 2) son to father, 3) younger brother to older brother, 4) wife to husband (woman to man), and 5) younger person to older person. Under the concept the li, the dominate person receives respect and obedience from the subordinate person but is by no means a dictator. He is supposed to reciprocate with love, goodwill, support and affection towards the subordinate person. 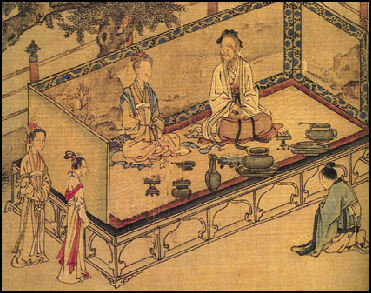 The Confucian code of subordinate relationships also extended to professions, with scholars at the top. Confucian scholars used to grow their fingernails long to show they didn't do physical labor. Under Confucian systems crimes were often dealt with by ostracism and humiliation rather than physical punishment. Following rules is expected of the masses and is seen as putting the needs of the group ahead of the desires of individuals. "The problem of human equality," wrote historian Daniel Boorstin, “was not vivid in China. There, where tradition and customs ruled, the best qualities of life were viewed as products of Chinese tradition and customs." Chinese put a strong emphasis on social harmony and group consensus. Traditional Chinese society was bound together by the two important concepts: 1) an agreement on community responsibilities that everyone in a neighborhood or village was party to; and 2) a method of organizing a community so that everyone helped everyone else with agricultural chores such as planting, weeding, harvesting and winnowing to make sure all these tasks were done efficiently for everyone in the community. There is strong emphasis on working hard together for common goals. One Chinese saying goes: “Endurance can turn a iron bar into a needle.” All one has to do is look at the Great Wall or the Grand Canal to see what this kind of thinking can achieve or look at the Great Leap Forward or the Cultural Revolution to see what it can destroy. Today you can see what happens when working hard together for common goals is applied to making money and producing economic growth. Getting Chinese to work together isn’t always easy. There are a lot of conflicting interests, competition and one upmanship in China. One old Chinese saying goes: “eight departments can’t even cooperate in raising a pig.